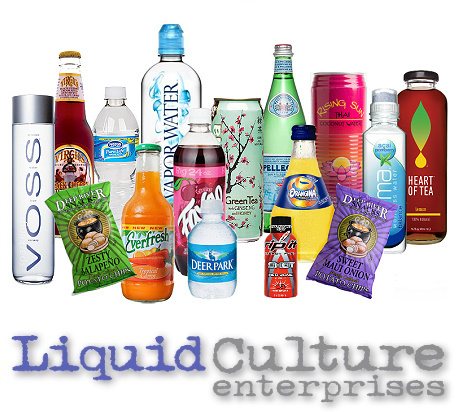 Located in Charleston, South Carolina, Liquid Culture Enterprises is a distributor of beverages and snacks. Servicing the Lowcountry area, Liquid Culture prides itself on creating a truly hand-picked portfolio of quality products that work for our client's specific outlet. From popular juices, sparkling water and energy drinks, to a growing line of snacks, we deliver! Some of our products include: Karma Wellness Water, Virgil's / Reed's, Rising Sun, Arizona, Gatorade, Nantucket Nectars, Orangina, Yoohoo, Deer Park, Nestle Pure Life, Sparkling Water, White Rock mixers/seltzers, Rip It, Faygo, Everfresh, Perky Jerky, Mike's Peanuts, Deep River Snacks and more.